So I found out last night about the Purple Wings Charity through a post on the Osto My Fashion Facebook group, could be some interesting companies there. 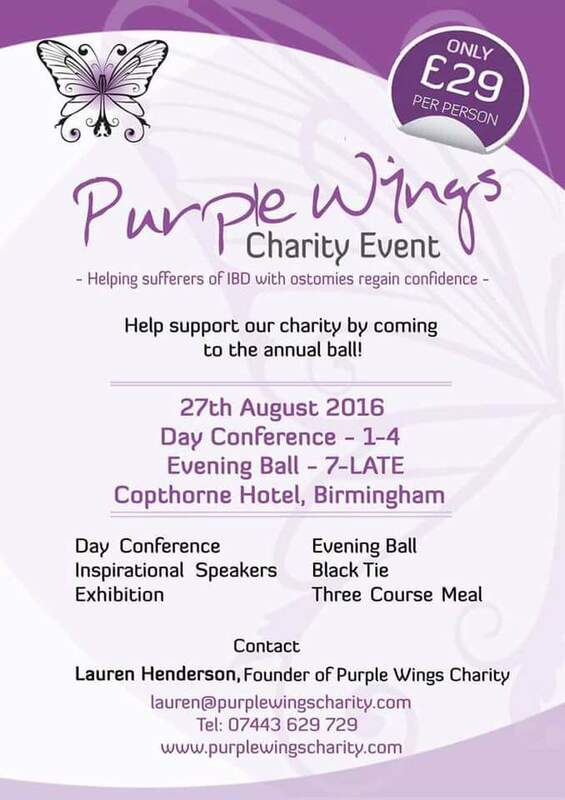 During the day there are stalls from companies selling things ostomy related, plus ostomy splliers and delivery companies, guest speakers and on the evening a black tie ball, with a three course meal included. I decided to message Lauren (the woman organising the event, she is also the founder of the charity) to see about attending. I was very lucky to snap up one of the remaining free tickets that had been donated. It’s going to cost a heck of a lot in my travel and overnight stay so I am super appreciative. There may still be tickets available to buy so please get in touch with Lauren if you want to attend. Purple Wings helps those with stomas from IBD to apply for a grant from themselves to give the person some “me” time be it a spa day or a photoshoot. Those living with IBD/stomas can find day to day life hard when you have/had been so ill for so long. I think it’s a great idea because you can lose a sense of self or confidence with the disease. You can help the charity by donating to their go fund me page. Please check out the charities website here! I have just officially put 00Steve’s mind at rest because I have bought my train tickets and paid for a hotel room. The train station is in the middle of my hotel and where the event is. I also have just gone and bought some outfits to take with me to see which one makes me feel like I’m going to fit in with a black tie event ha ha but after all I’m too punk to be posh!